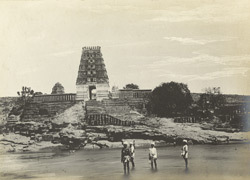 Photograph of the main gopuram or temple towerof the Chennakeshwaraswami Temple on the hill, at Pushpagiri, north-west of the Cuddapah District of Andhra Pradesh, taken by a photographer of the Archaeological Survey of India in 1898-99. Pushpagiri, "the hill of flowers" is situated on the banks of river Pennar. The site is sacred both for Saivites and Vaishnavites and is famous for a group of eight temples forming a single complex situated on top of a hill devoid of all vegetation. The Chennakeshava Temple dedicated to Vishnu, the largest and best known among them, dates back to 1298 A.D according to the earliest inscriptions found in the temple complex, but was reconstructed in the 15th century. It has a tall gopuram, seen in this view, and it is decorated with sculptures depicting scenes from the epics of the Ramayana and the Mahabharata and floral motifs, and has elaborately engraved pillars.